You will find a lot of fiber “hidden” in my recipes! The reason for that is that a high intake of fiber offers a range of health benefits AND helps with weight control because it allows you to fill up on fewer calories. 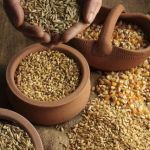 What you WILL find in my recipes are lots of whole grains, legumes and beans, fruits and vegetables, all rich in fiber. I have lots of little tricks throughout my recipes to add fiber to my dishes and as I come across them when I feature any recipe, I will come back and revisit this little tip post and explain why I did what I did! So, you can expect this page to grow…. Whole wheat pastry flour is milled from soft wheat and is perfect for pastries because its lower protein content makes it lighter than regular whole wheat flour which is milled from hard red wheat. I love to use whole wheat pastry flour for my more delicate pastries because it is still rich in fiber and is much better nutritionally than white flour. Place 1 cup Nature’s Path® multigrain cereal + 1 cup Kashi TLC Original 7-grain crackers in a food processor and grind until fine to make fine crumbs. You will find it in my Crispy Chicken Tenders, Chicken Parmesan, and with some variation in my Poppy Seed Crusted Salmon and many more I haven’t posted yet. Stay tuned!